This month, former Food & Wine staffer Emily Kaiser Thelin publishes UNFORGETTABLE: The Bold Flavors of Paula Wolfert's Renegade Life. Here, five recipes from this gorgeously rendered tribute to a cooking legend. Proust had madeleines; Paula Wolfert has eggplants. 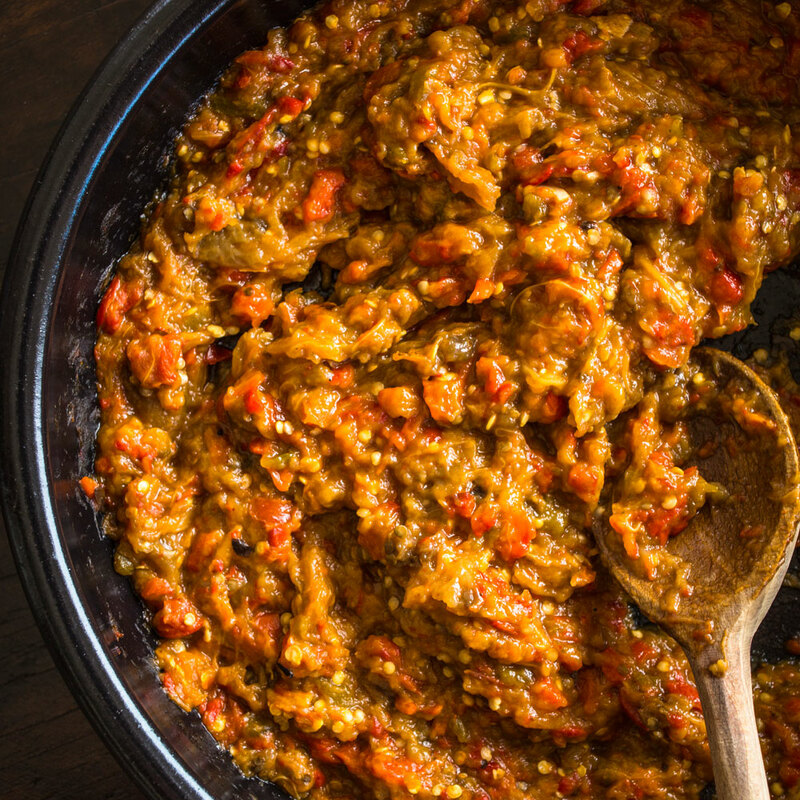 Her love of nightshades was seeded in her childhood, and this is her best guess at her grandmother’s recipe for a Balkan eggplant spread she often made when Paula was growing up. Tangy and only faintly garlicky, it’s an ideal accompaniment to just about anything: grilled skewered meats (like the sausages that follow), grilled fish or vegetables, or spread on bread in a turkey or tofu sandwich. 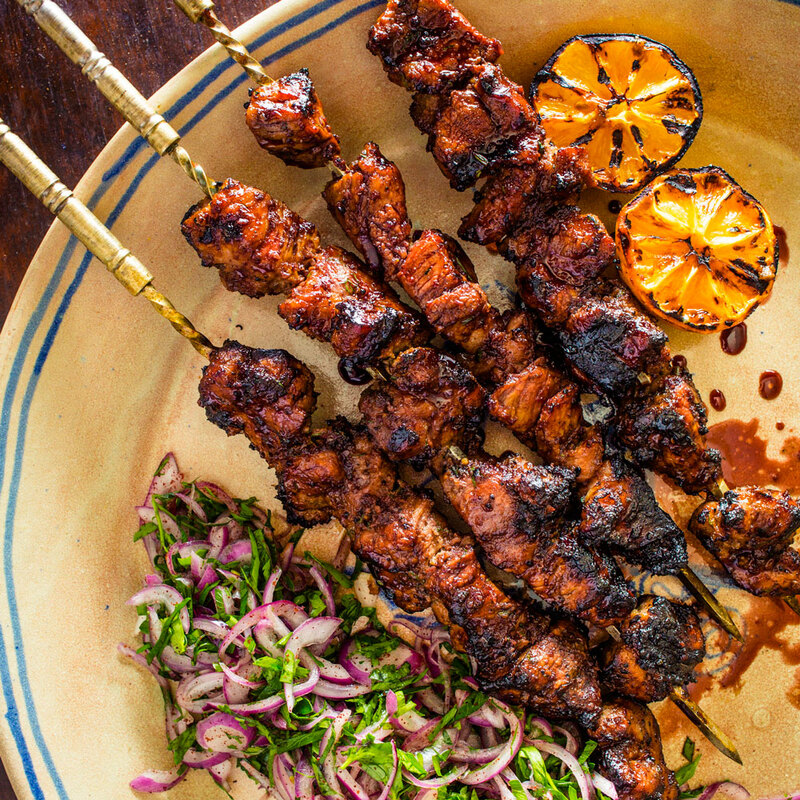 Paula learned how to make these herby, tangy skewers on an adventure in the Caucasus Mountains. The same marinade is also delicious with chicken thighs or extra-firm tofu. The onions are traditionally grated by hand, but the marinade comes together in seconds in a food processor. The onion-parsley salad is a classic kebab accompaniment Paula was taught by a master of kebabs, Burhan Çağdaş of Gaziantep, Turkey. This is Paula’s brilliantly approachable take on one of the most iconic restaurant dishes ever invented, the gargouillou of chef Michel Bras of Laguiole, France. Paula introduced Bras to the United States in an article she wrote about him in 1987. Like all her favorite chefs, he elevates the humble peasant foods of his region. Gargouillou is traditionally a Laguiole vegetable soup flavored with ham. 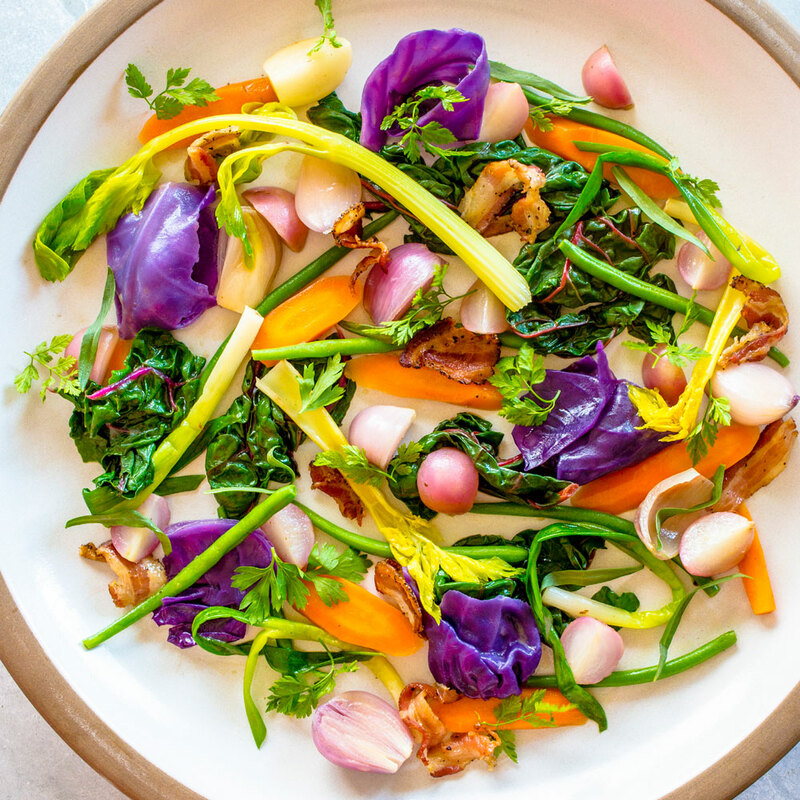 Bras deconstructs it, blanching the vegetables separately, tossing them with crisped pancetta, and garnishing them with foraged flowers and weeds. That version has since spawned dozens of homages around the world. But when Paula published this recipe in World of Food in 1988, its name was little known, so she called it Spring Vegetables in the Style of Laguiole. This is the most forgiving and delicious duck recipe you’ll ever find. By slow-cooking duck with aromatics until it’s as tasty and tender as confit, then broiling it until the skin is shatter-crisp, Paula Wolfert manages to play to all of the bird’s strengths. If you’re feeling lazy, you can simply serve the duck with the strained pan juices and forego the stock and olive sauce altogether. If you’re feeding a crowd, you can cook three ducks in a large roasting pan, increasing the onions and aromatics slightly and allowing just a little more cooking time. And you can prepare the dish two days ahead and finish it off at the last moment. Just be sure to have the butcher cut the duck for you—that’s the only step that can be tricky.